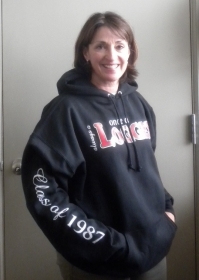 "ONCE A LOGGER, ALWAYS A LOGGER"
This "xxxxx" BLACK hooded sweatshirt, modeled by our very own Cherie LeRoy Zygaczenko, is a great way to stay warm on those chilly fall evenings! Plus, the proceeds of every purchase will help the Eureka High Athletic Boosters and the Axe Club provide scholarships for graduating seniors! Sample sweatshirts along with ordering information will be on display at the Reunion. Welcome to the Reunion Store. You can PERSONALIZE ITEMS with your name, number, year, design and of course our school name. THERE ARE NO MINIMUMS and items are shipped to you directly from the factory. Click on any "Buy Now" button and you will be brought to a page where you can choose from MANY MORE ITEMS (T-Shirts, Hooded Crewnecks, Sport Shirts, Golf Apparel, Jerseys, Outerwear, Fleece, Bottoms, Accessories, Headwear and more).